Water Bubble on the Ceiling. In February we revived a call from a local insurance agent. 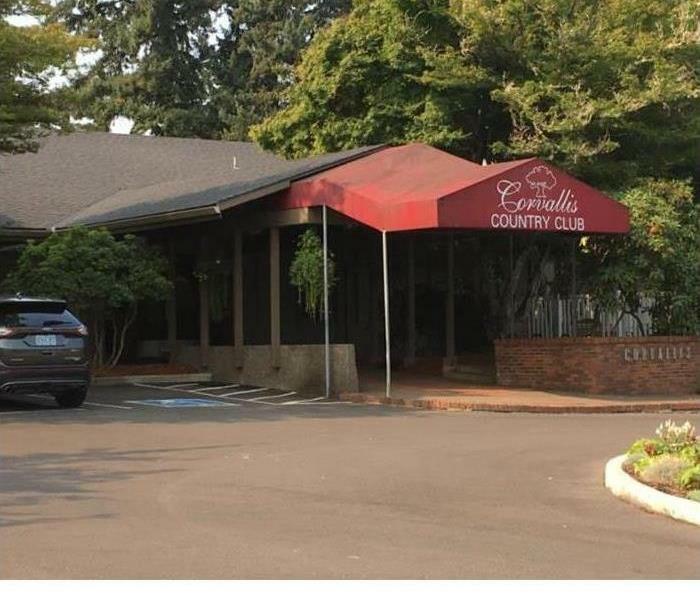 He had just had a new AC unit installed in his building that malfunctioned, and caused a giant water bubble in the ceiling. SERVPRO of Benton county responded right away, and help fix the Problem. That is why SERVPRO is here to help. This home was damaged by smoke/fire, and SERVPRO of Benton County came in and completely restored this room. You would never know there was a fire in this room. There was smoke damage through out most of this home. The fire was started by someone smoking in bed. This room was the most affected by the fire/smoke. When a pipe bursts in your office or building, it can be very disruptive to your business! Know that you can call on your team of Restoration Professionals at SERVPRO to help get you back in working order. In the Willamette Valley, we know rain. But sometimes, when a storm rolls through, we can see more rain than we are used to. This can lead to flooded crawlspaces and basements. When disaster strikes, feel confident in knowing you can count on your Water Restoration Specialists at SERVPRO! We can make it "Like it never even happened." 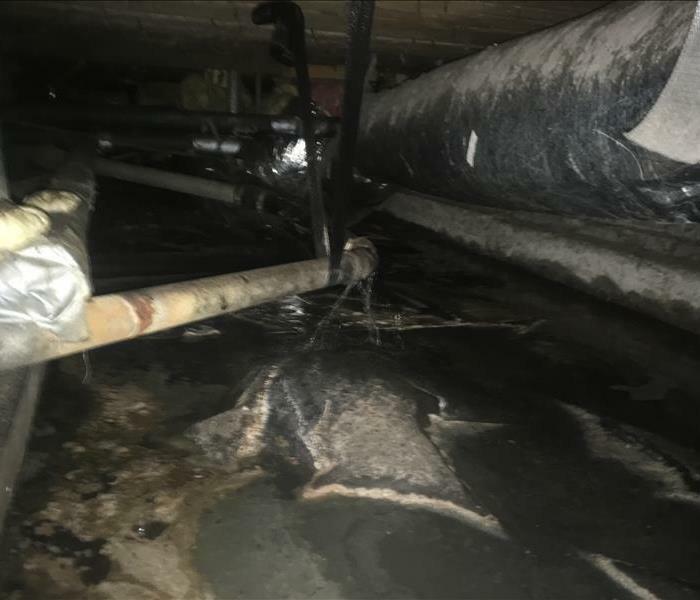 Water leaking into a crawl space, either from outside flooding, or a ruptured pipe can lead to disaster! Standing water under a home can lead to mold growth, and unpleasant odors rising up into the house. If you discover standing water under your home, or place of business, call your SERVPRO of Benton County team today! When any disaster strikes, our primary concern is to get you back into your home as quickly as possible. Our trained and professional crew members respond to any size disaster, so your family can move on with your lives. We can make it "Like it never even happened." 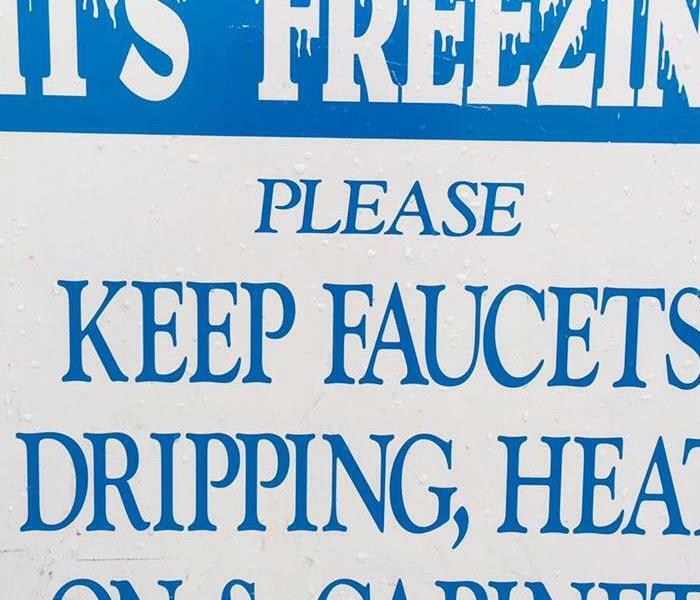 In Oregon, everything is wet. Which makes any space a prime candidate for mold. 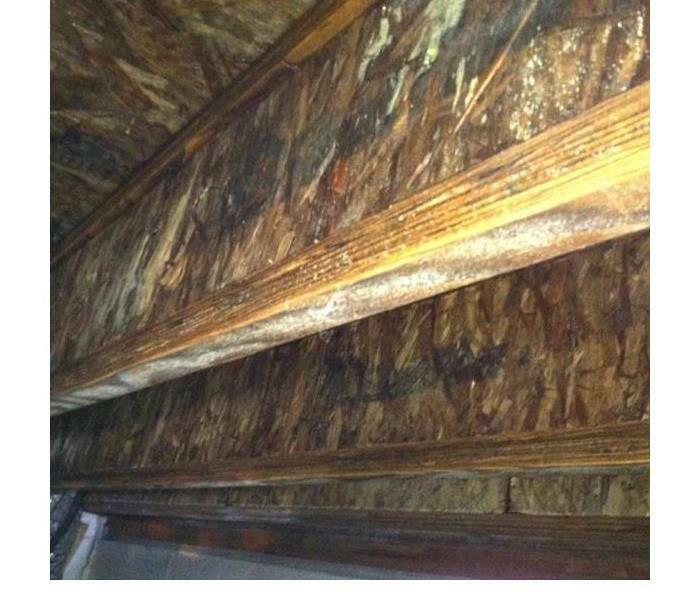 It can grow in crawl spaces, attics or in between walls long before you even notice it. Remember, once we SMELL mold, its already in there. If you see mold, or consistently smell a musty odor, call your team of Mold Remediation Professionals at SERVPRO of Benton County, today! We hope to discover mold before it gets this bad. But mold usually is a symptom of a greater problem. When you find mold, there could be a ventilation issue, a water leak, or another on-going issue. 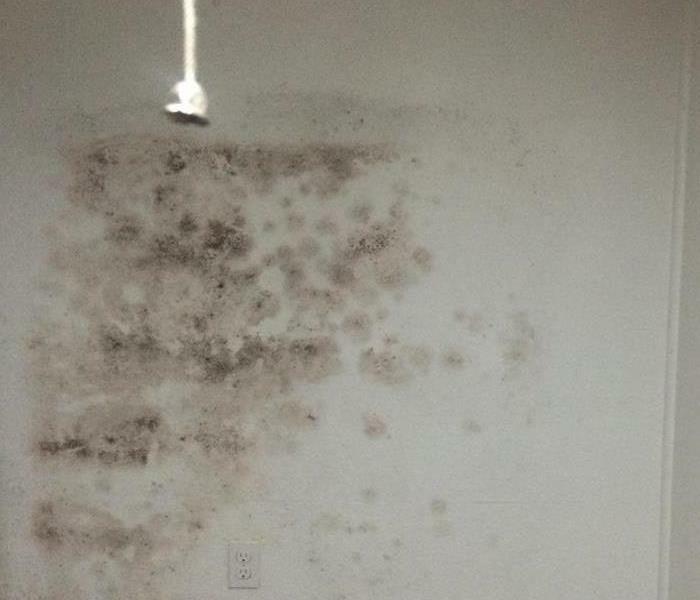 When you find mold, call your Mold Remediation Specialists at SERVPRO! We can help get to the bottom of your mold problem. 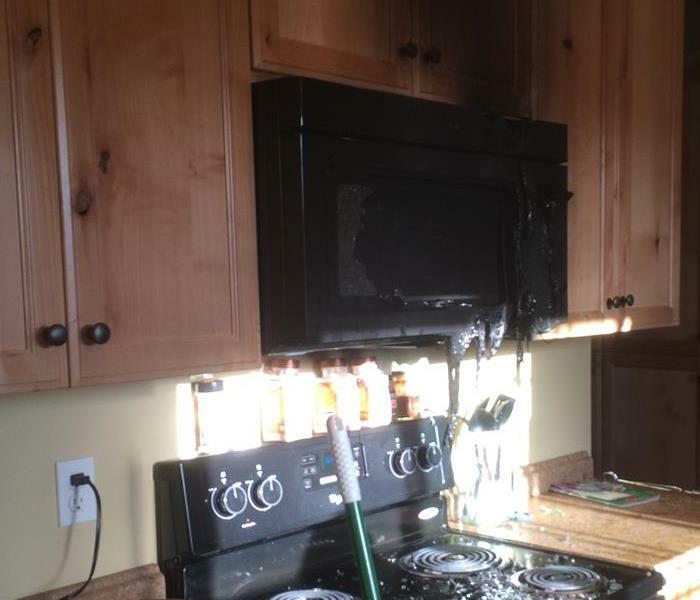 Even a seemingly small kitchen fire can be disruptive to our daily lives. Damage to appliances, to cabinetry, and the lingering smell can interfere with our day to day activities. 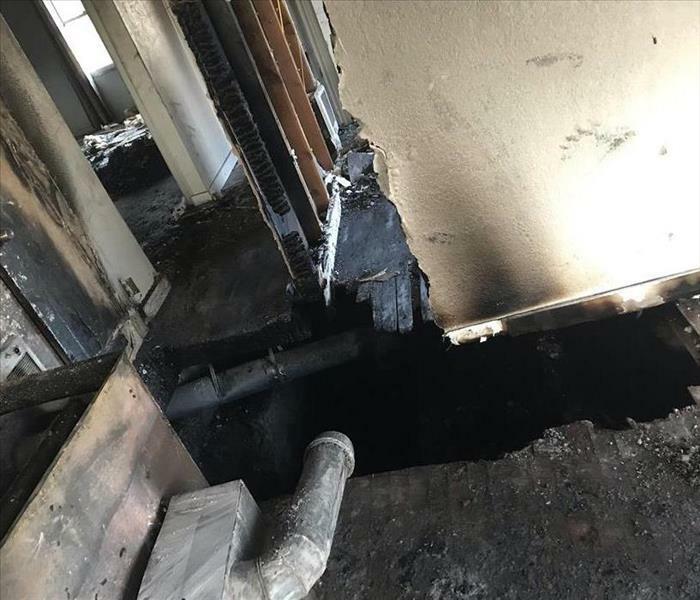 Call on your SERVPRO Fire Restoration Specialists to help get your home back to its 'preloss' condition and get your life back to normal. When disaster strikes the workplace, our professionals at SERVPRO are here to help! Whether a natural disaster, or a broken pipe, no job is too big, nor too small for our Certified Water Restoration specialists! Call us today! We have many beautiful tall trees here in Oregon. But when a storm rolls through, the mix of torrential rain and wind can bring down those trees...and onto our homes. When nature brings the unexpected, know that you can count on the Restoration Specialists at SERVPRO! 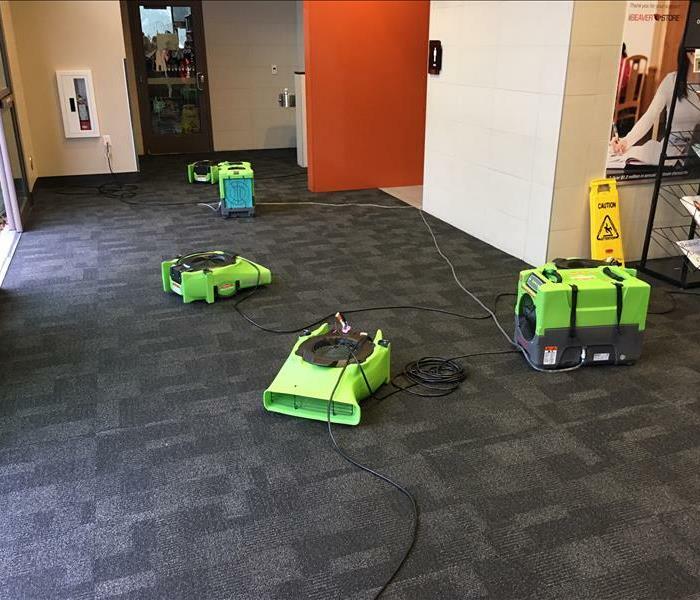 When this school needed a crew to give their building a thorough clean, they called upon our Professionals at SERVPRO! We are always happy to help out and keep our community looking its best. Do not hesitate to call us for your Commercial Cleaning needs! Last October devastating wildfires tore through Northern California destroying over 7,500 structures. 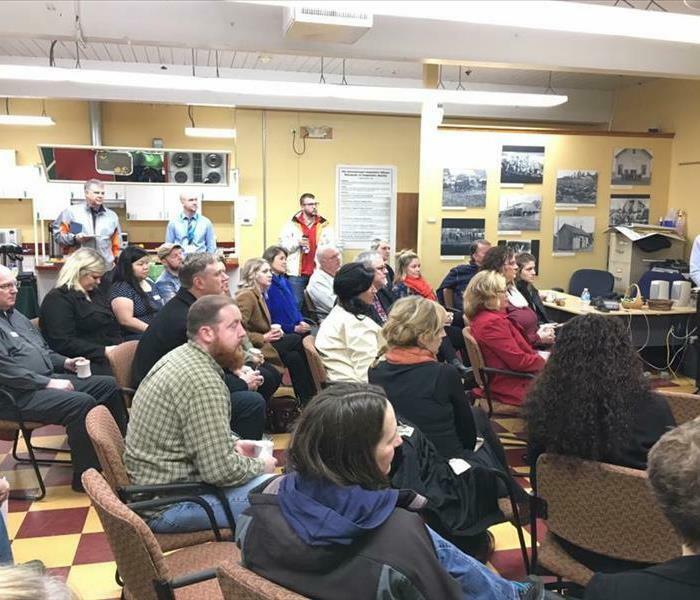 Over 37 Franchises mobilized to assist in the cleanup process. 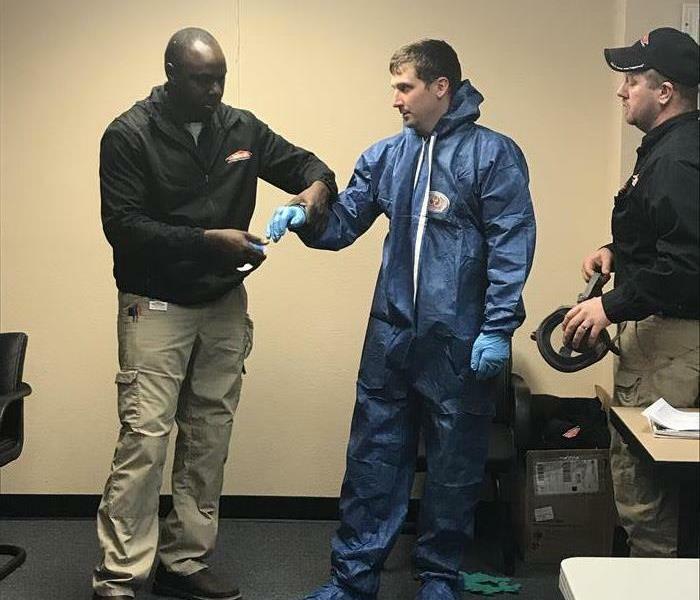 SERVPRO of Linn County was one of those Franchises that assisted in cleaning smoke and soot from homes. Their customer service and attention to detail is second to none. 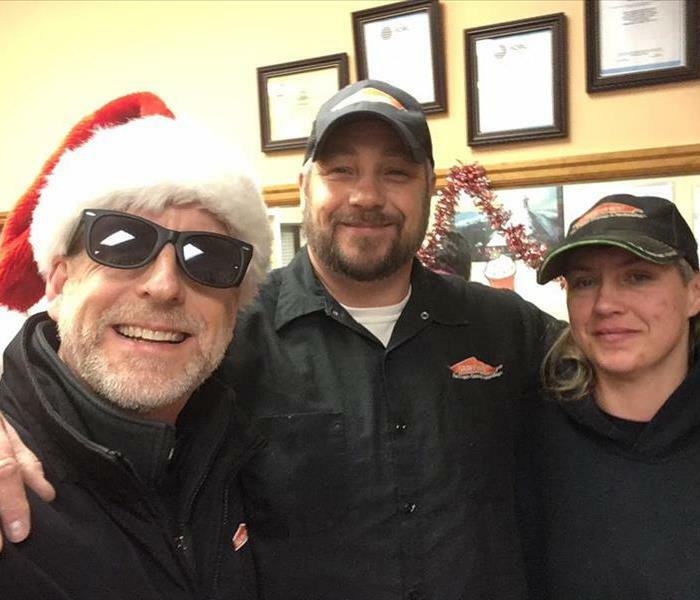 It is not everyday customers take their service provider out for dinner and that is exactly what happened to SERVPRO of Linn County. Because of the impression they made on one family, turning their home from soot-covered to spotless, they were treated to a dinner by the homeowner to express their appreciation. 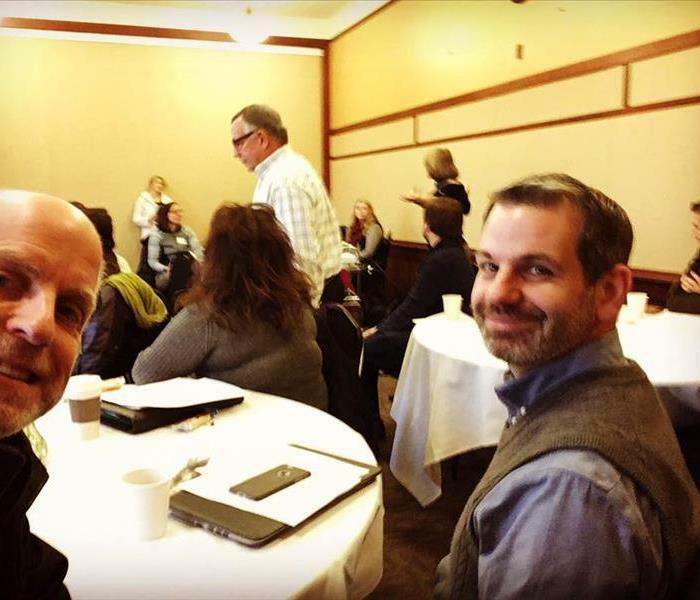 Lets congratulate Nick Mcginnis and their crew at SERVPRO of Linn County for being recognized. Last October devastating wildfires tore through Northern California destroying over 7,500 structures. Over 37 Franchises mobilized to assist in the cleanup process. 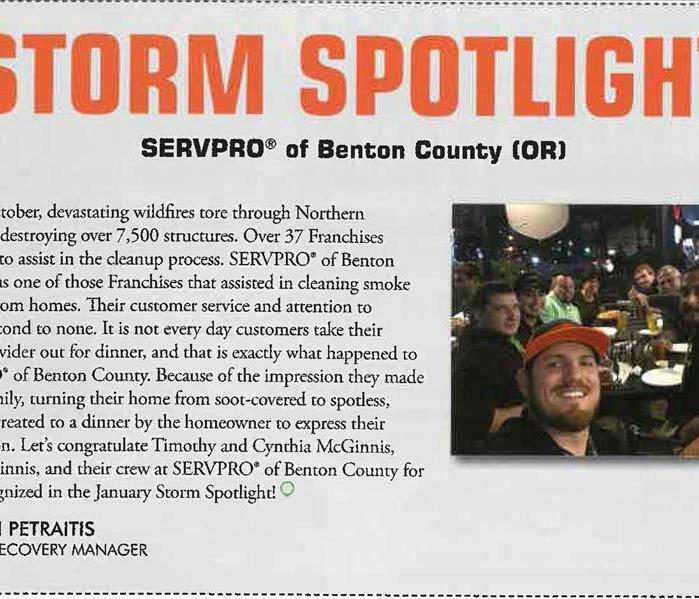 SERVPRO of Benton County was one of those Franchises that assisted in cleaning smoke and soot from homes. Their customer service and attention to detail is second to none. 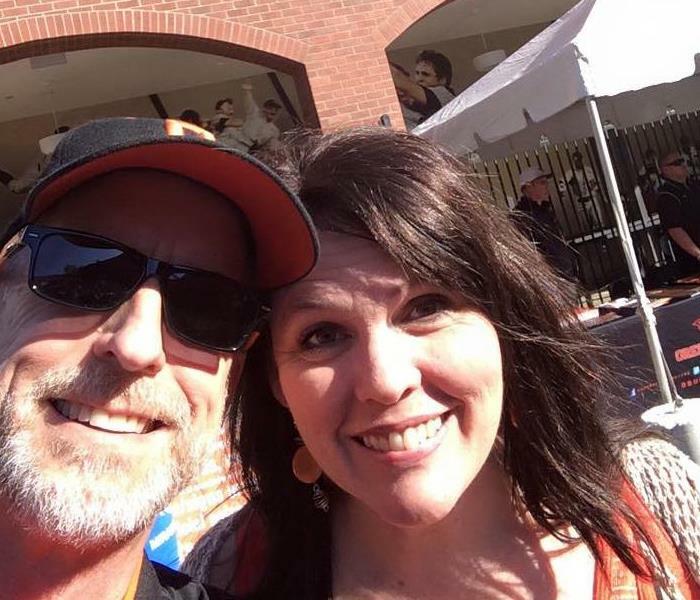 It is not everyday customers take their service provider out for dinner and that is exactly what happened to SERVPRO of Benton County. 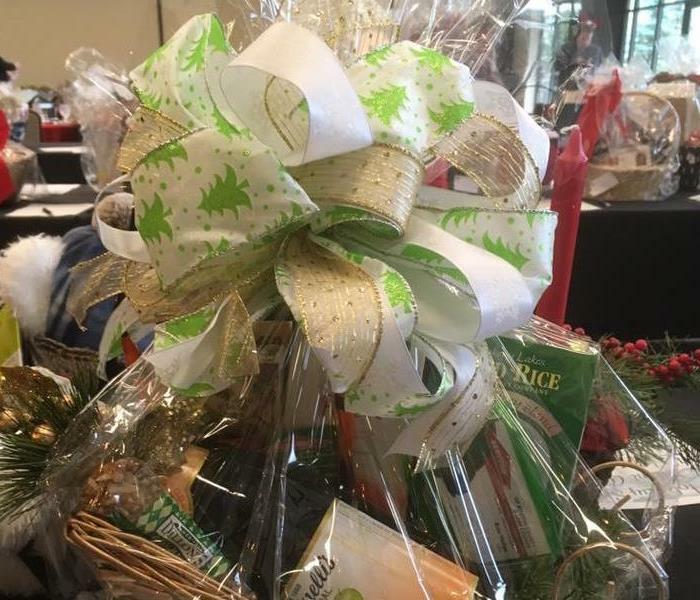 Because of the impression they made on one family, turning their home from soot-covered to spotless, they were treated to a dinner by the homeowner to express their appreciation. 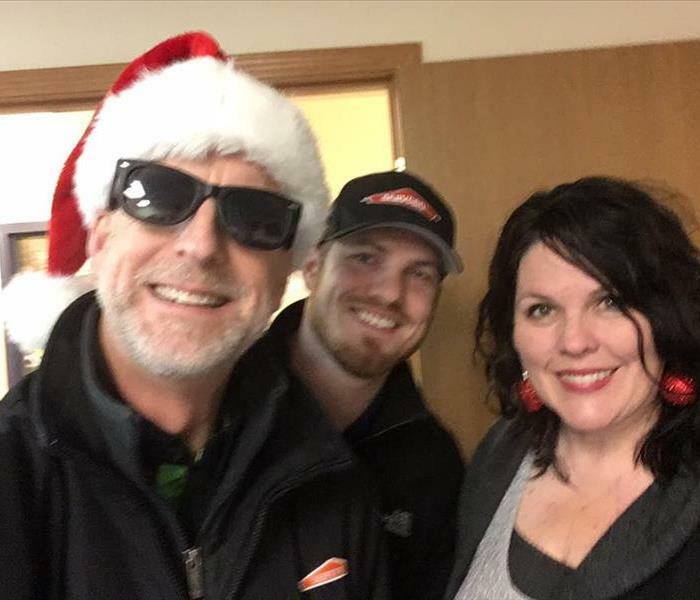 Lets congratulate Nick Mcginnis and their crew at SERVPRO of Benton County for being recognized. We look forward to helping your business get the water damage restoration and preparedness sheets in order for your business. We want you to be prepared in case of emergency. Storms cause major damage! The aftermath can be ugly, but with SERVPRO there to help it will be taken care of in no time! We plan to leave you with the satisfaction of returning to your life "Like it never even happened." 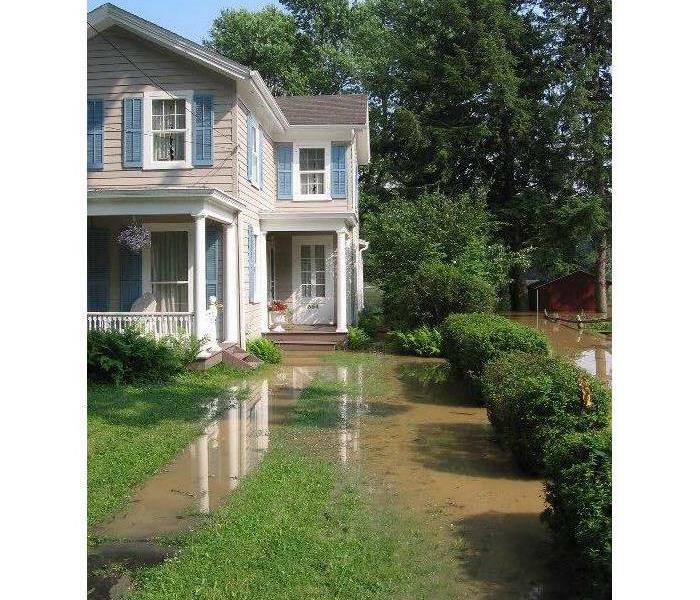 Flooding in this house occurred due to a broken pipe in the winter. 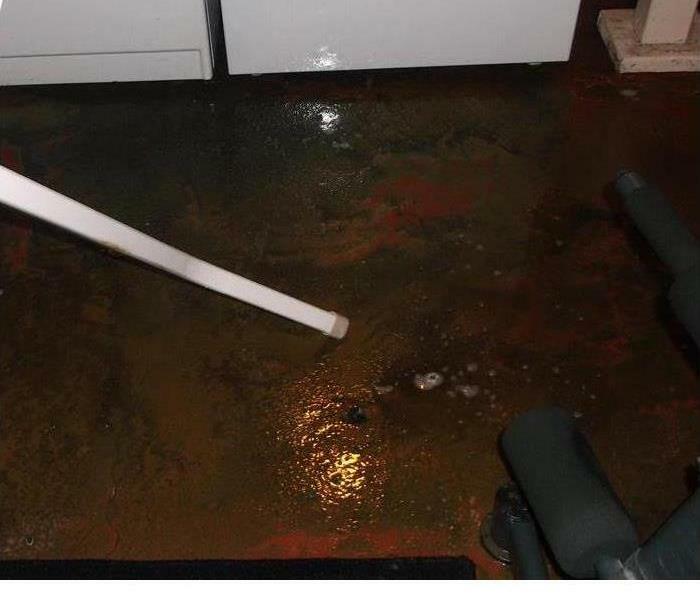 With a quick call to the experts in water extraction at SERVPRO, this was taken care of in a professional and efficient manner. If disaster strikes your home don't forget to give SERVPRO a call! 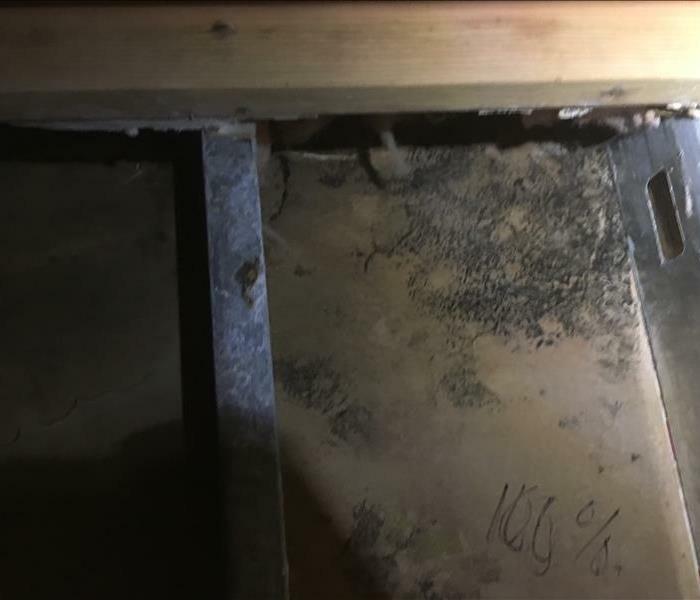 Mold in the frame work is very common in our wet climates. Often hidden from sight, it is left to grow without mitigation. When found, we use our top of the line equipment to remove any growth and prevent further growth. 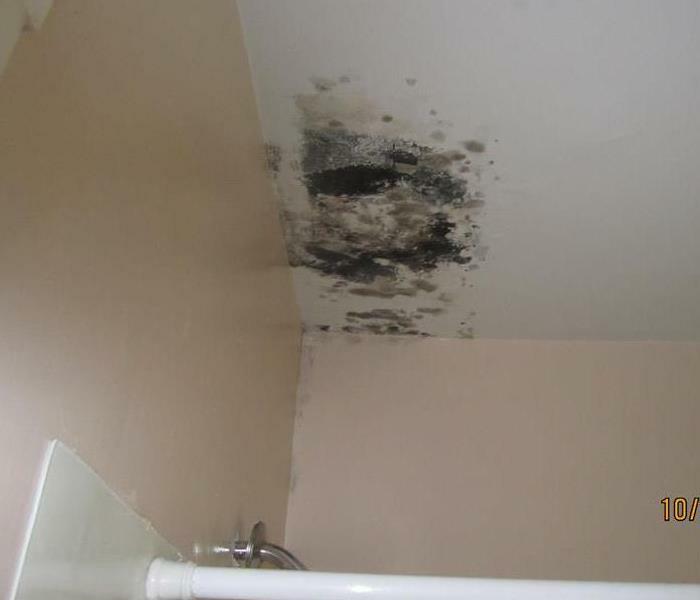 Mold develops very easily in the corners of bathrooms. Sometimes it is undetectable until an item obstructing a view of the wall is moved. When it is detected, however, our crew is quick to respond and mitigate the growth. 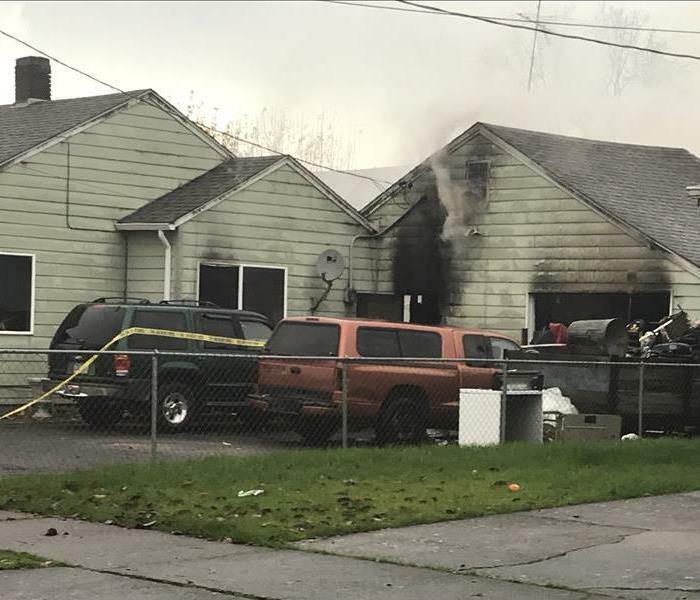 When the Burger King in Albany, Oregon burnt down our team was the first on the scene.We were able to take care of the property clean up after the Fire Department put out the fire. We truly are faster to any size disaster, making it "Like it never even happened." 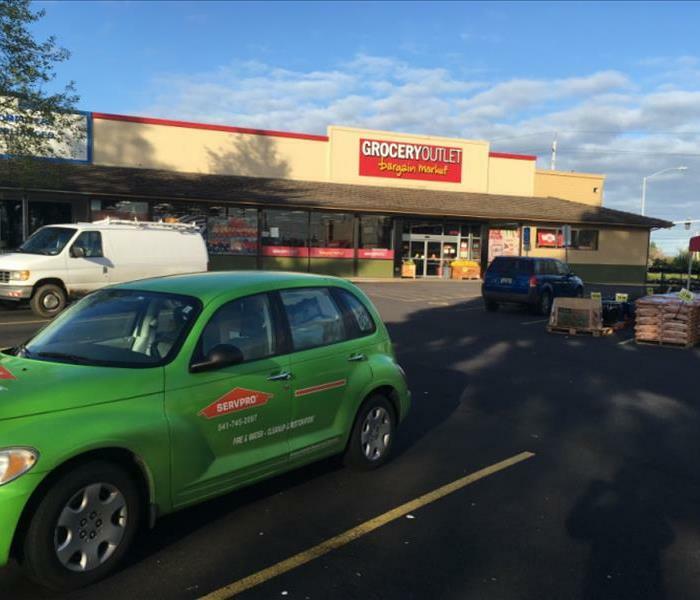 SERVPRO of Benton County is here for your commercial needs! There is no job too big for our work crew. Outfitted with the best equipment for any disaster, our crews work thoroughly and efficiently to get the job done. Call us today for all of your clean up and restoration needs! We advise against allowing the mold problem in your house develop into this. With the first sight of mold call the experts at SERVPRO! We're always here to help and our promise is that we will make it "Like it never even happened." 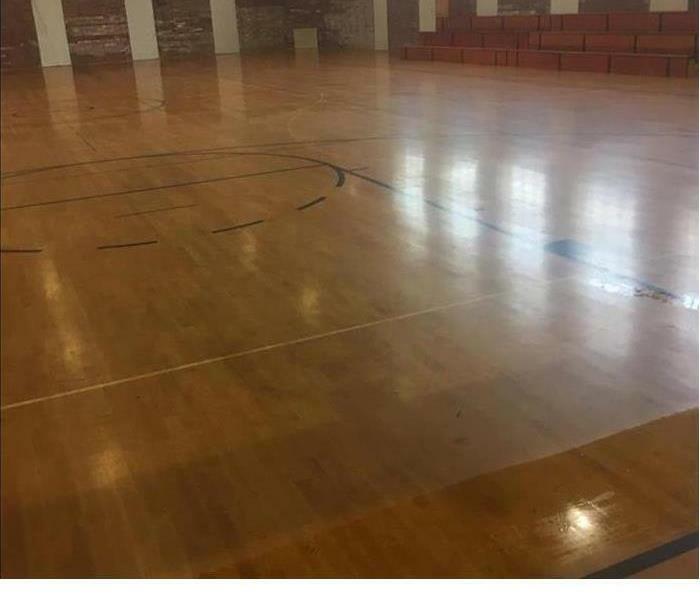 Nothing is too big for SERVPRO! 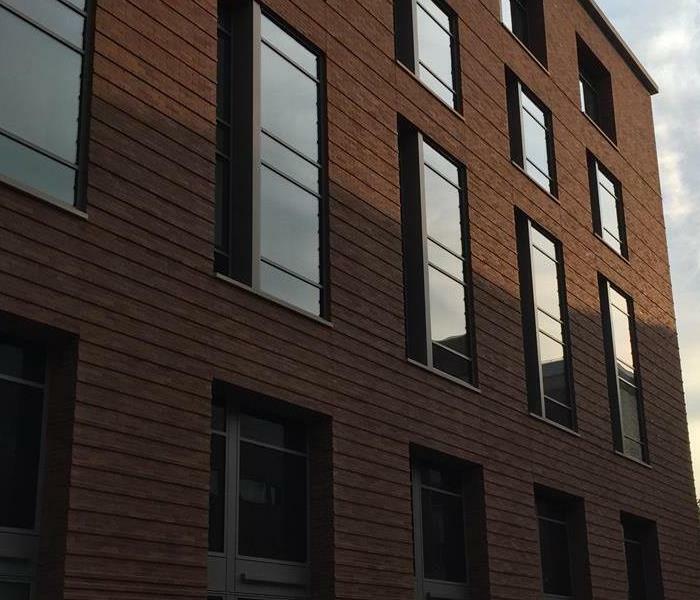 Whether residential or commercial, we are there to help and restore the property back to it's preloss condition. A storm caused water damage to this kitchen but luckily SERVPRO was there to help! Intense drying methods are required after storms and flooding. This is no problem with the help of our top of the line drying equipment, such as air movers, dehumidifiers, water extractors, and much more. All our crews are extensively trained on how to operate the equipment to it's maximum effectiveness. Our work crews are trained in all aspects of clean up. Even that tough biohazard job! From the project managers to the clean up crew, everyone gets the ins and outs training. And our customers are left with the satisfaction of knowing that professionals are on the job. We are faster to any sized disaster, making it “Like it never even happened.” Our team provides fast and personal help when a call is made. We are trained to respond to you with care and compassion, putting your needs above all else. Even the largest of area rugs is not impossible to dry and restore to perfection! 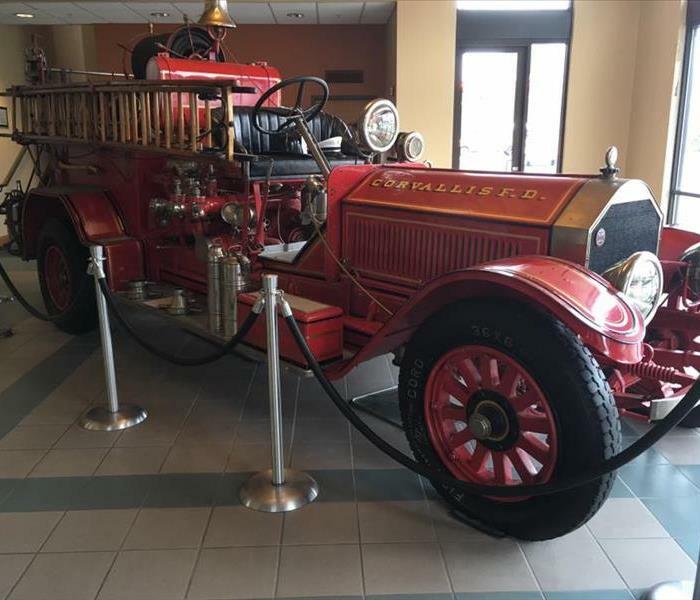 The machinery we use is the best in the business and gets the job done, returning your property back to the original condition. Do you have a large room needing to be dried after a storm or flooding? SERVPRO can help! Our work crews are equipped with all the best tools and equipment for whatever the job. 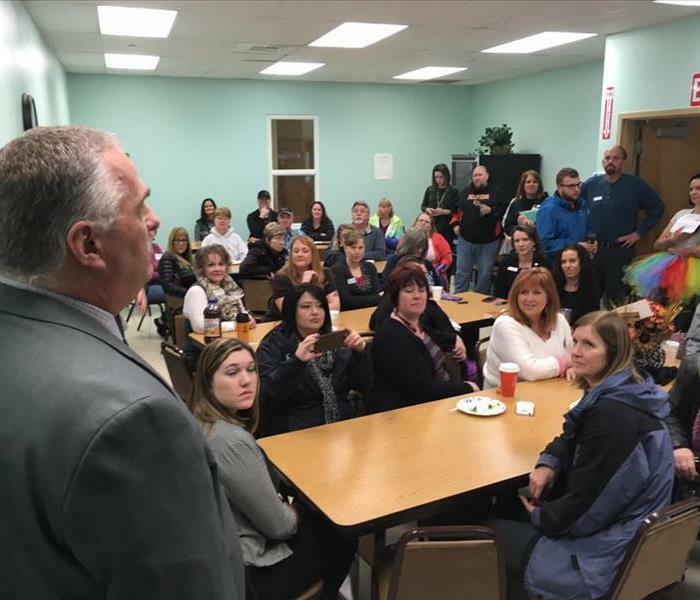 We have strong relationships with businesses in our community. 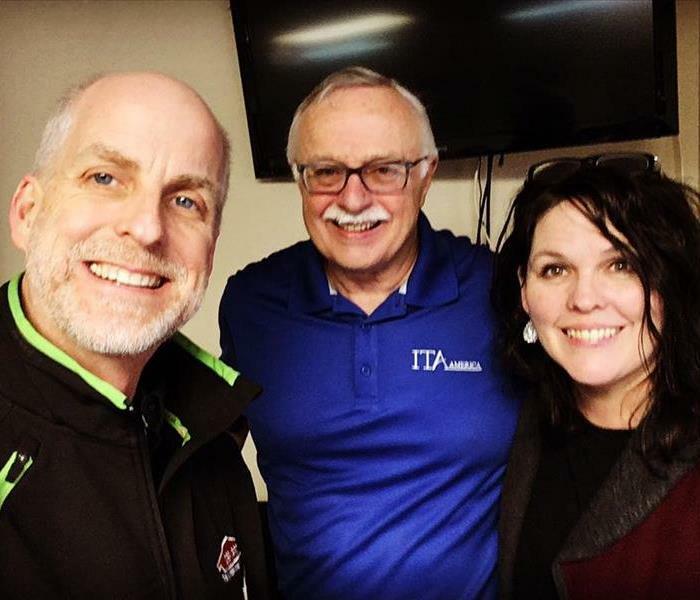 We work to get the best team of restoration experts for our community. Let us help you get the restoration, cleaning and damage help in Corvallis Oregon. SERVPRO can help your business get the storm protection and restoration that it needs. 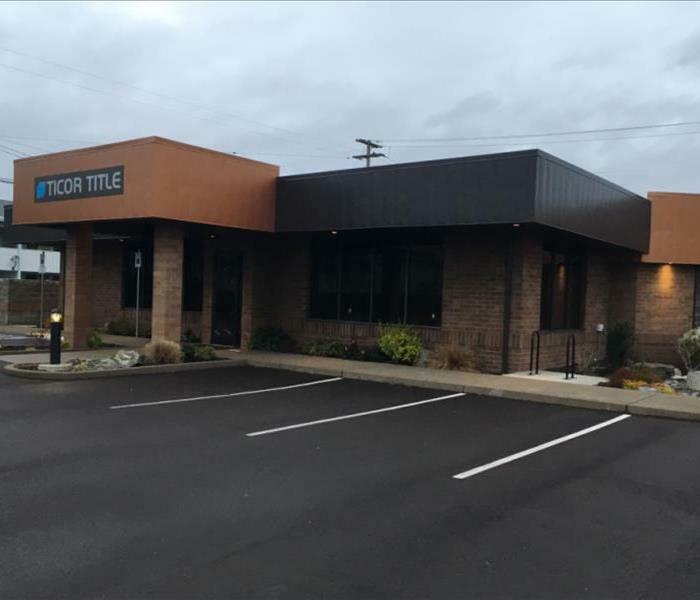 Let us help you get your business protected in Corvallis Oregon. We aim to help you get the best service when you are having a difficult time with water damages in your home. Let us help you get the water restoration you need. SERVPRO restoration is a great way to get your damages restored and fire damages fixed. 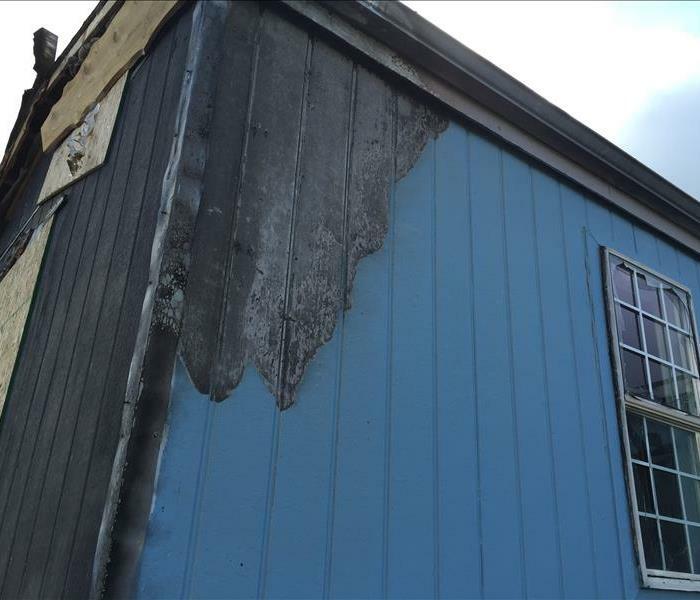 Let us know if we can help you with your fire damage in Corvallis Oregon. We look forward to being able to restore your water damages. We aim to help businesses in our community get protection from water damage and restoration when it happens. SERVPRO can help you to remediate your mold problems with our variety of different cleaning and damage restoration services. We help businesses get set up with a disaster plan to make sure they have the proper plan in place and in case of an emergency SERVPRO is here for you. 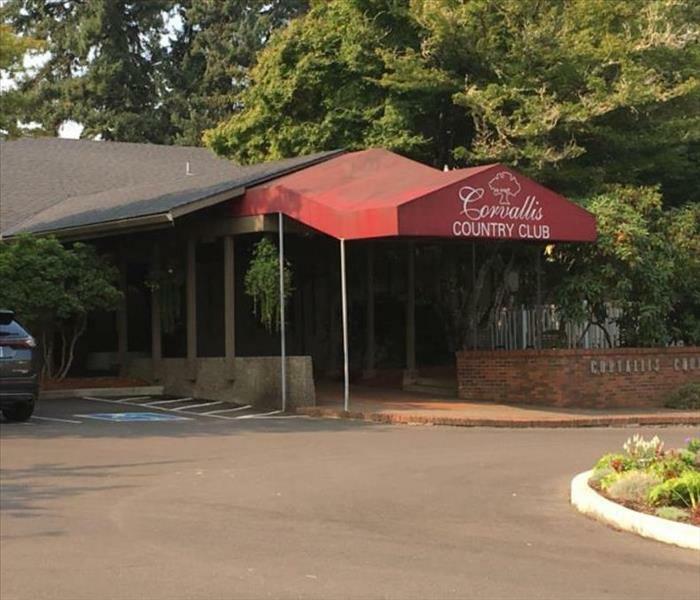 We helped with general cleaning services at a golf club in Corvallis, Oregon. We look forward to helping you with your cleaning needs. We love to be involved in our community and help as many people as we can with their damages. We help people with all different kinds of restoration from water damages to mold damage. SERVPRO can help you keep your home safe this winter. A broken pipe can damage your home for a long time. SERVPRO can help you fix it. 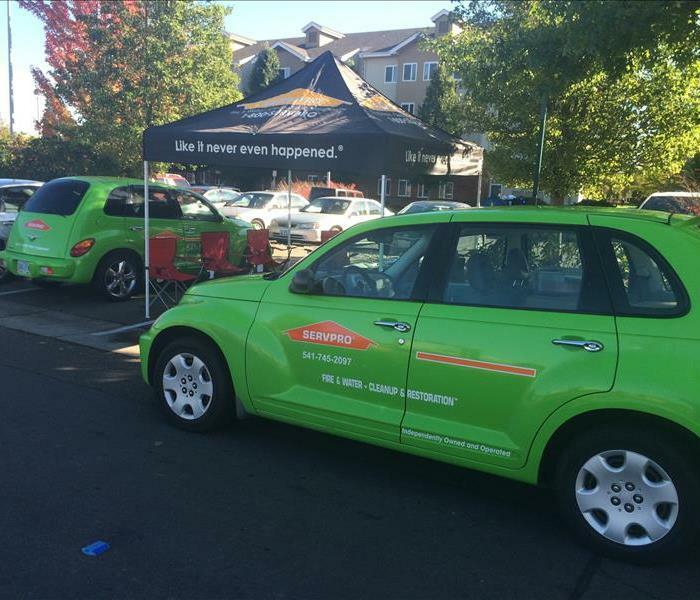 We go all over the Community to represent SERVPRO and all that it offers the community. We look forward to working with our community on all of their restoration needs. 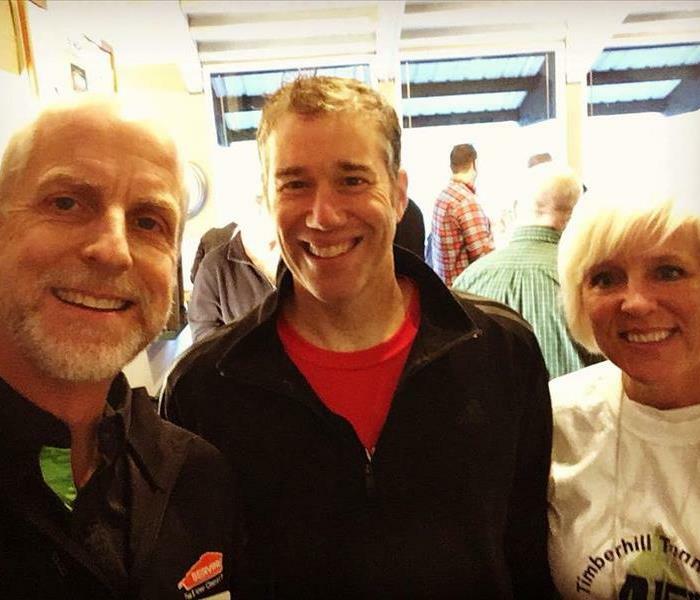 SERVPRO does business with our community and supports local business. 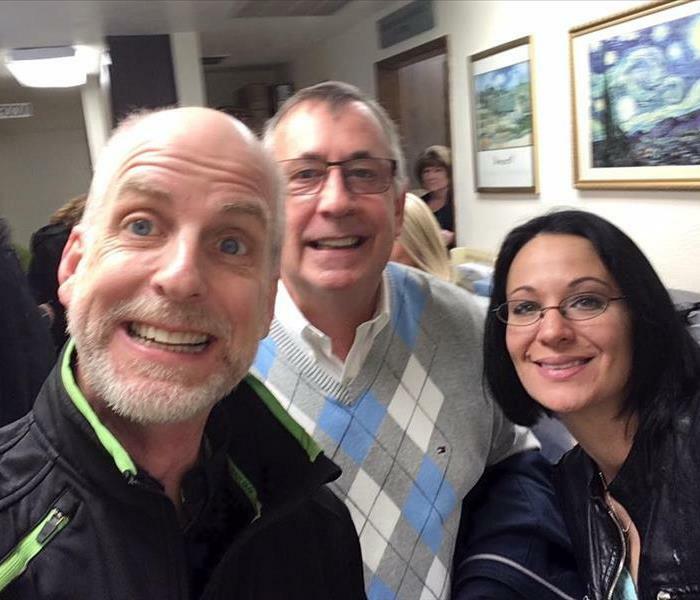 Find us at the Corvallis Chamber and see what we can do for you. We offer cleaning services as well as damage repair. We love to stay up to date on all the important new laws so we can do a great business. We aim to provide our clients with a great service that restores their home after a damage. 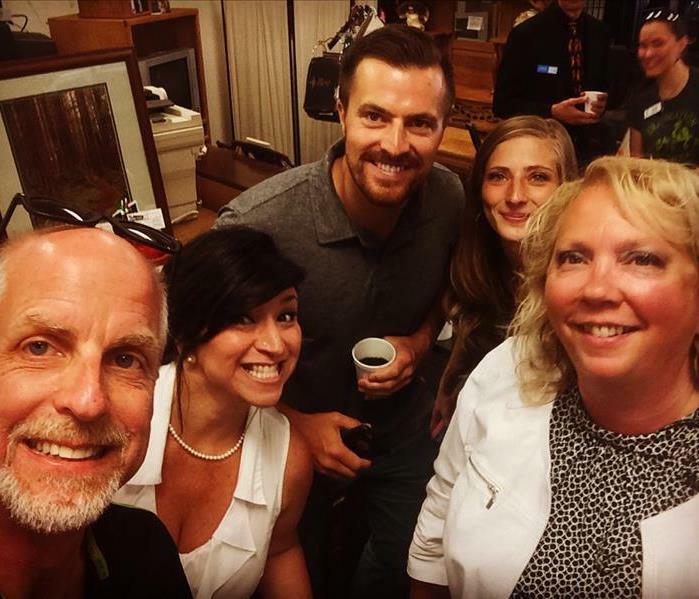 Such a Fun Group at the Lebanon Chamber Greeters! Contact SERVPRO for any damage restoration needs you may have. We look forward to working together to restore your home from damages. 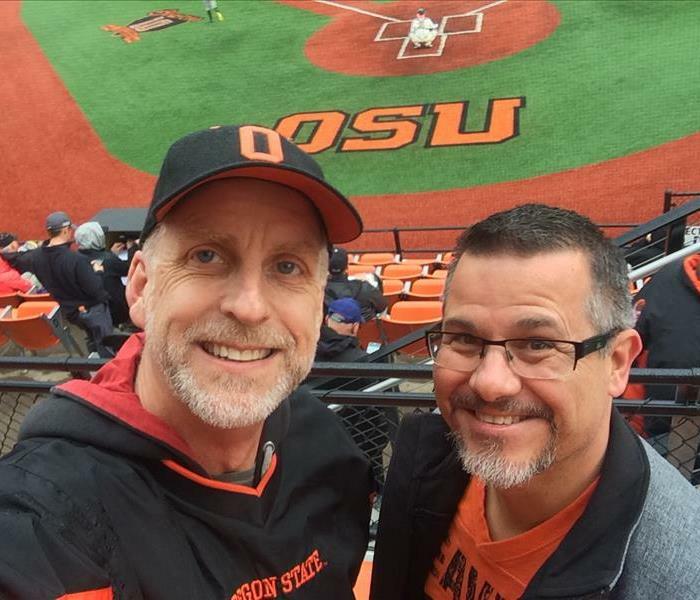 We love to support our local team in Corvallis the BEAVERS. 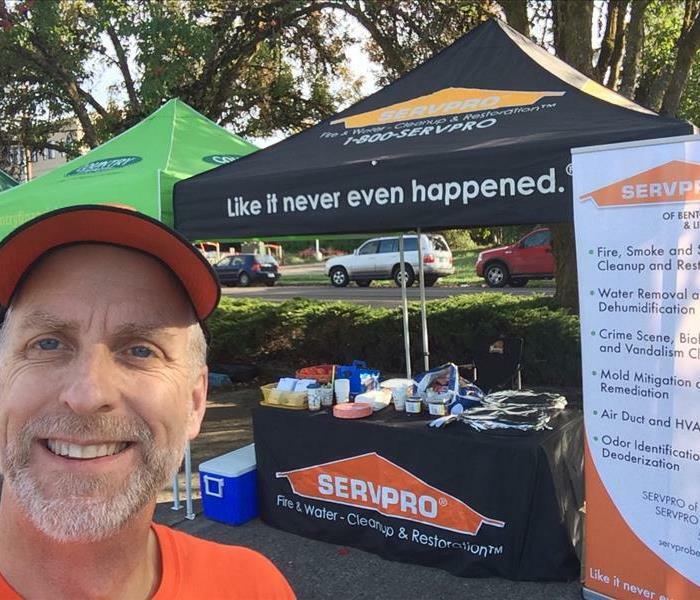 Find SERVPRO at a local beavers game. We can remedy your home from any mold, water or fire damage that occurs. SERVPRO can help you get your home cleaned up after a wet winter storm. We can help you get any water damage restored for your home. 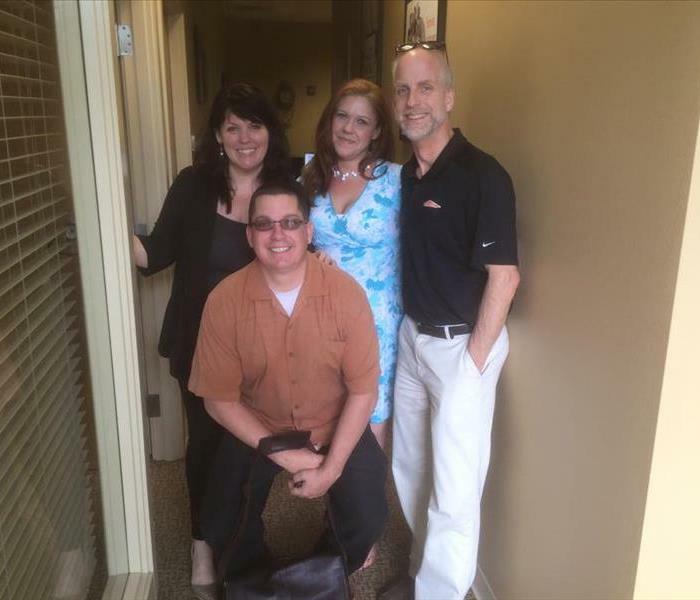 SERVPRO is here to serve you and meet our team today. We can restore your home from water damage when it happens and make sure that you dont have a reoccurring problem. 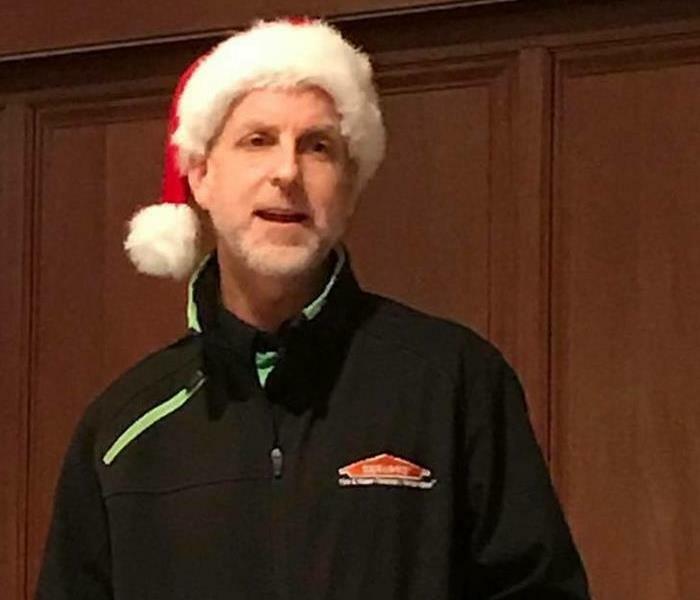 We love the holidays here at SERVPRO, keep your family safe during the holidays by using our tips for fire safety and christmas tree safety. We will make sure its like it never even happened. 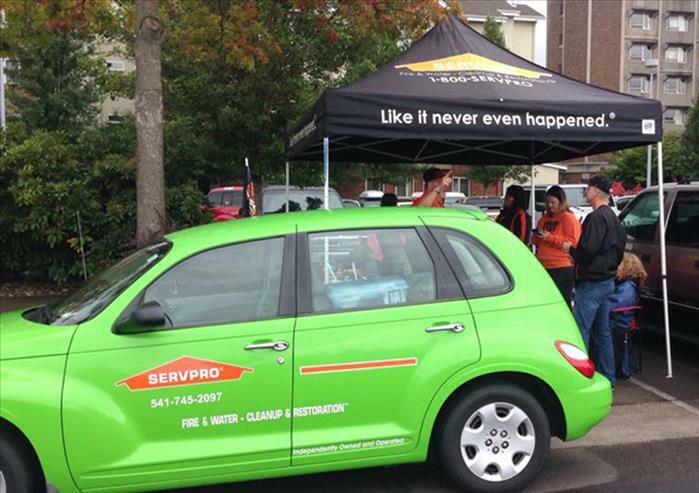 See SERVPRO in your community and what we do to serve our community. 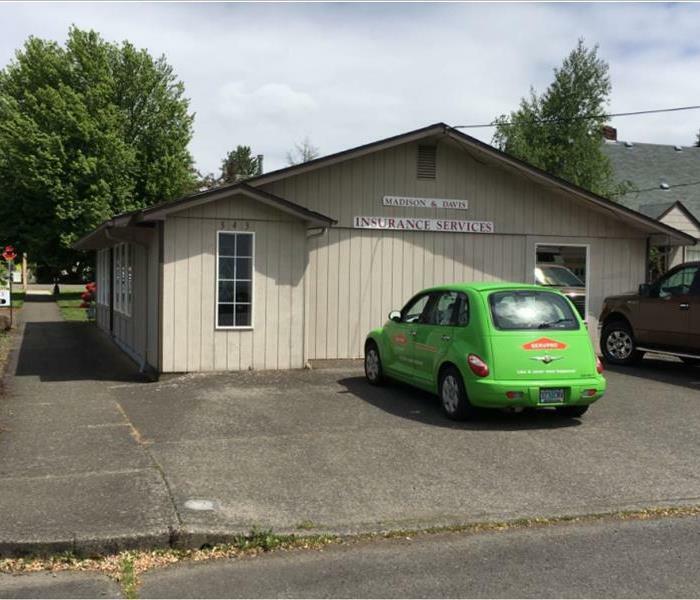 Find us in Benton and Linn Counties. 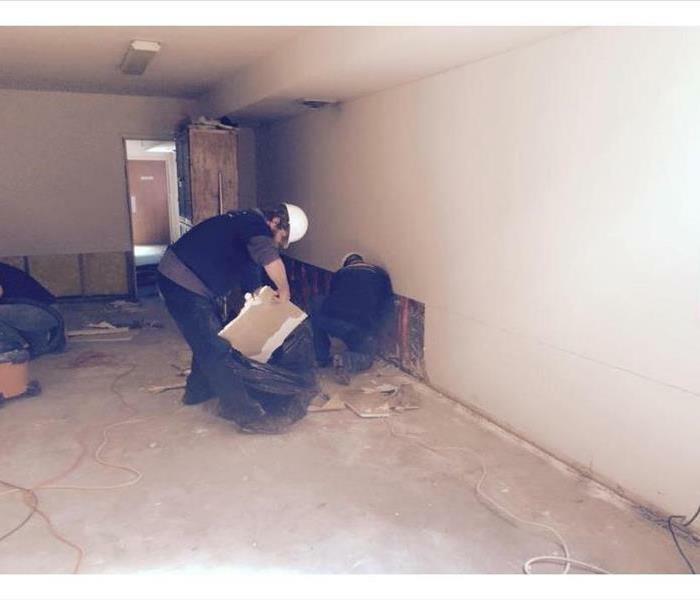 We aim to keep our community safe by offering mold remediation. SERVPRO is very involved in our community and we look forward to helping you with your disasters in every season. We will take care of your damage and make sure that it is well taken care of. 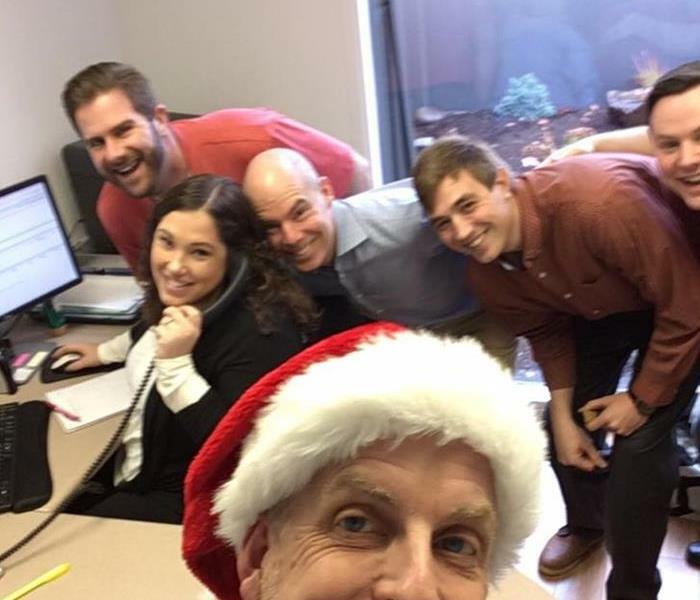 SERVPRO is ready for the holiday season! We look forward to serving you through any disaster you may have. Speaking about SERVPRO of Benton County and SERVPRO of Linn County at Corvallis NBG. SERVPRO does damage restoration for fires, water damage and mold remediation. Call us to learn more. We love to work with our community and help them with all their restoration needs. We work to make the damage "Like it never even happened." We will repair your damage in a timely manner every time. 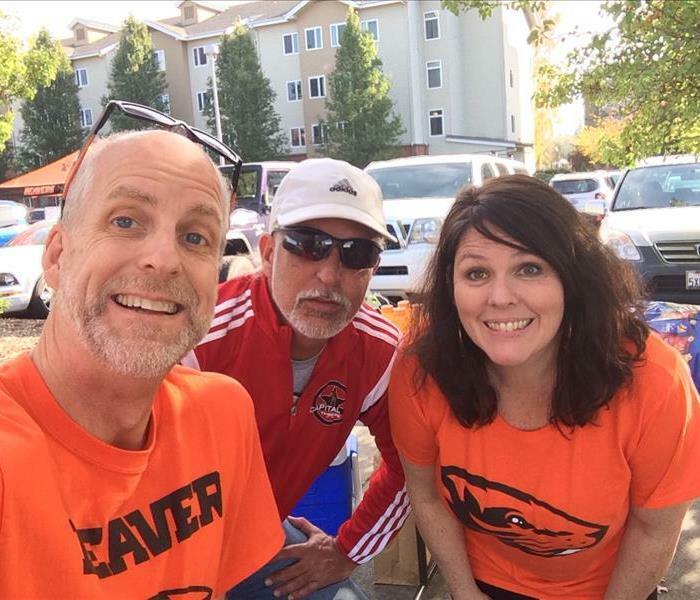 We love supporting our beavers and going to local games with our community. SERVPRO is a company that takes care of our community and takes care of you when damage strikes. Cube Wrap for SERVPRO. 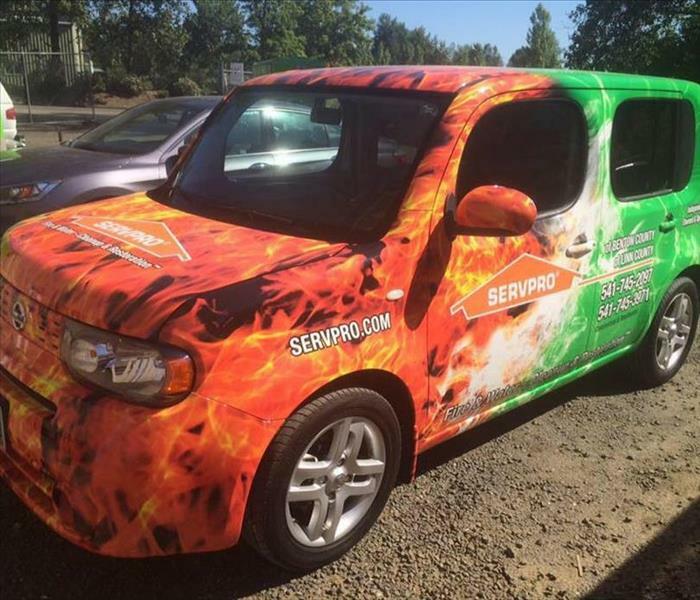 Have you seen our awesome SERVPRO wraps. We look forward to seeing you out in our neighborhood and taking care of you and your family when damage strikes. We are so happy to be in our community and have great events within our community. 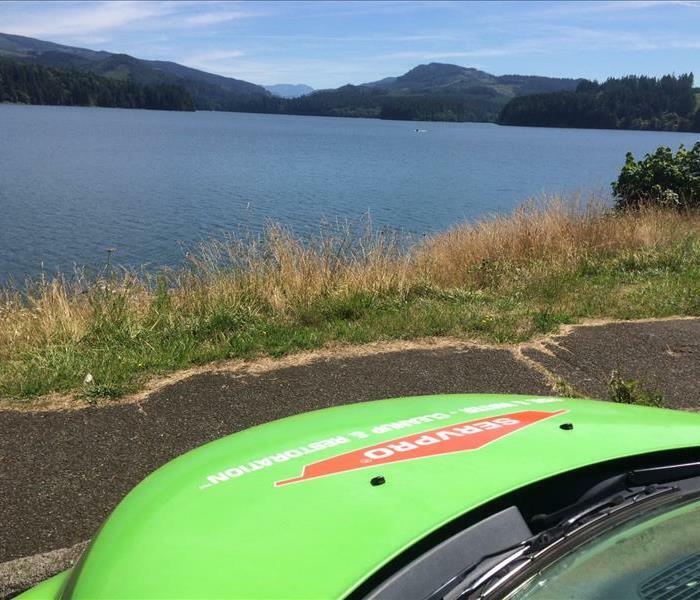 SERVPRO is happy to serve Benton County with all their restoration needs. If you are looking for damage restoration in Benton County. SERVPRO can help you restore your water fire and mold damage. We will make your home like it was before the damage happened. 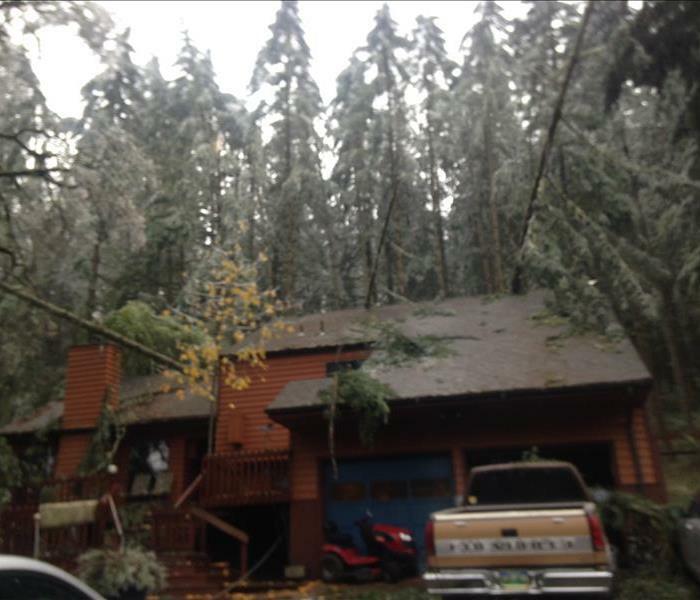 SERVPRO of Benton County is here to serve you with any damage restoration you need. Give us a call and be sure to let us fix your house up and make it like it never even happened. 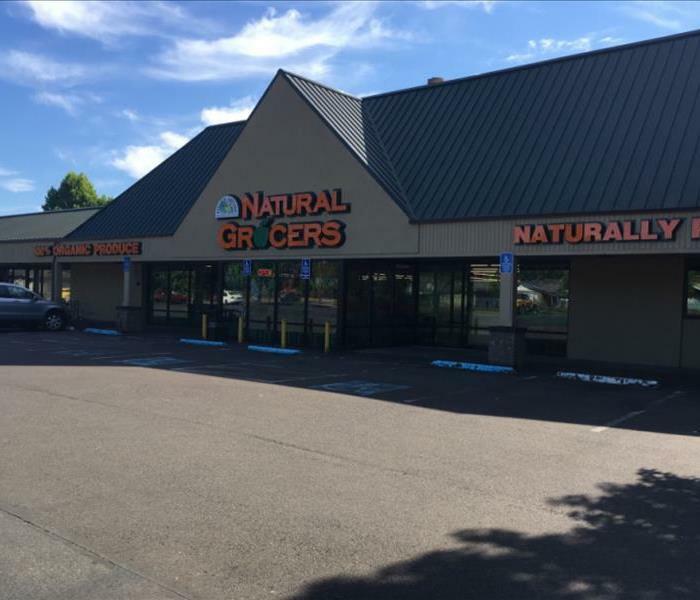 We love to be active members of our community and support local businesses. We can help members of our community with their restoration needs. We will restore your damage to preloss conditon or better. 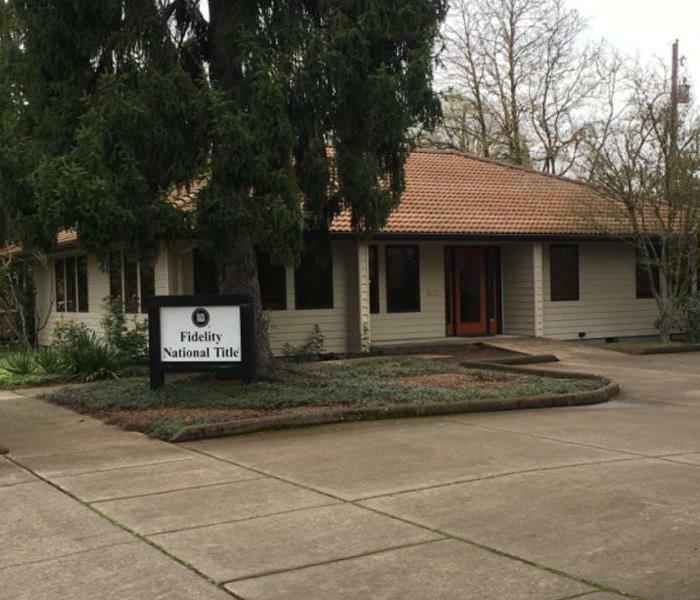 We love to serve our community in Oregon. We take pride in restoring homes in our community when damage strikes. We will make it "Like it never even happened." when we come to fix your home from damage. 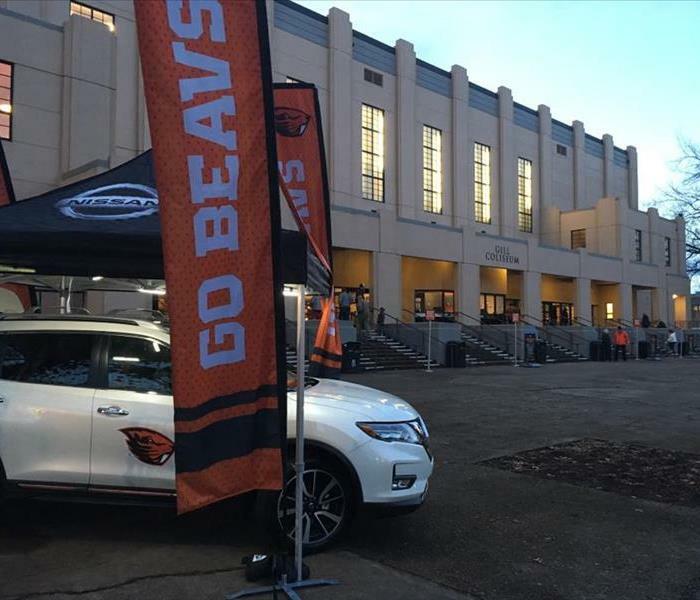 Find SERVPRO Of Benton County at a local Beavers game. 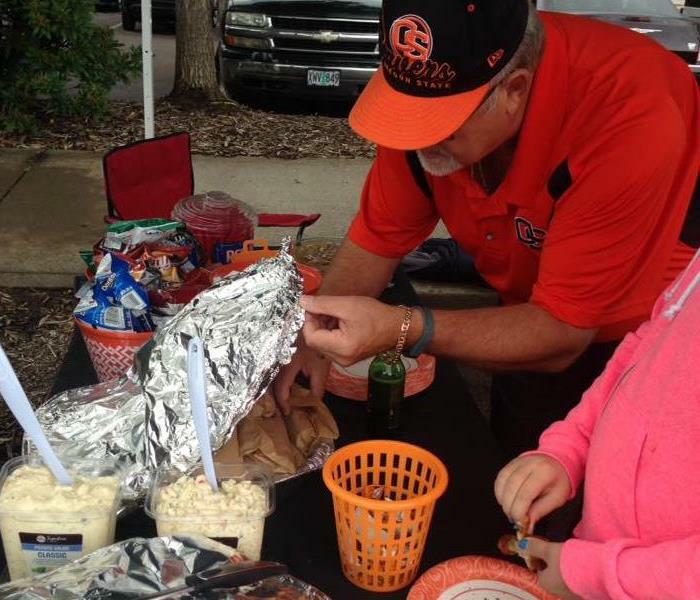 We love to tailgate, come talk to us at the next tailgate. 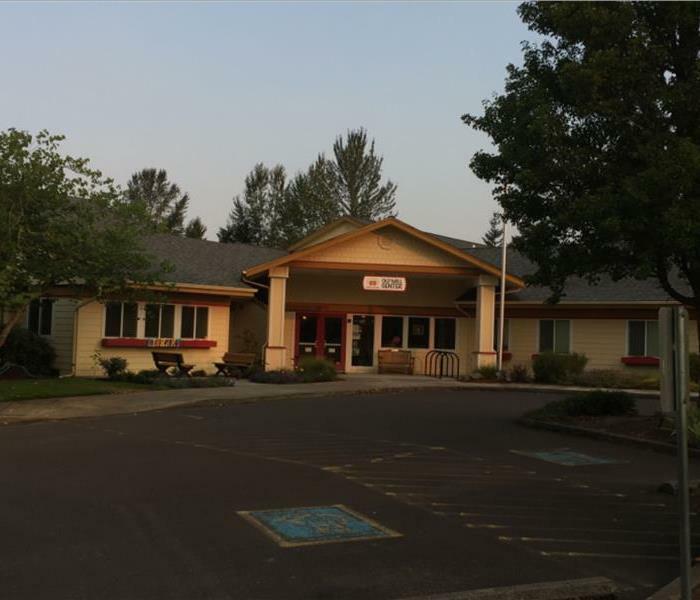 Get to know us at many different community events in corvallis and Albany. 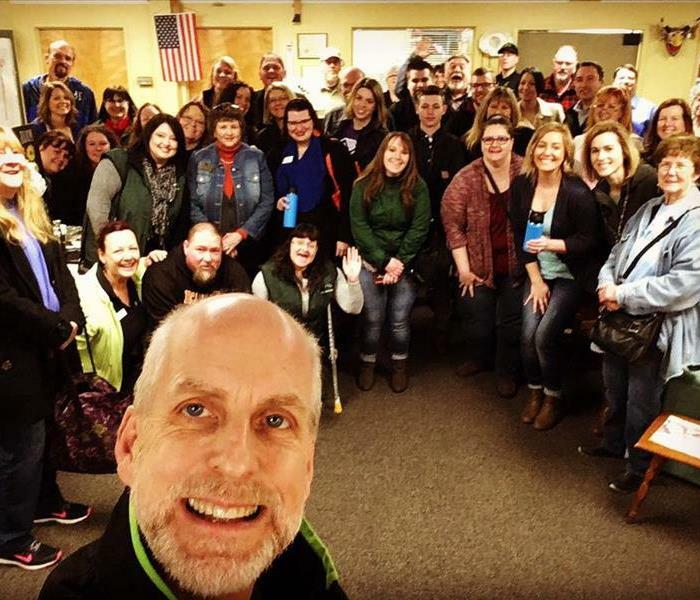 Become a part of the SERVPRO Community. We look forward to helping you with all your restoration needs. SERVPRO will help you with any water, fire or smoke damage that may happen to your home.